StockholmExpat.com | I believe in the power of positive thinking. Don’t Miss Stockholm Beauty Week! This This year’s Stockholm Beauty Week Promises To Be Amay May! and profs will gather to hear, smell, and experience the latest in beauty innovations and products. All the top names in Swedish beauty will be there launching new products, demonstrating the latest innovations. The wonderful thing about this three day event is that it is not limited to skin therapists, salon owners or product developers. People like me and you – those of us who LOVE beauty and fashion – are able to attend and get treated to treatments, seminars, demonstrations and more. And super great for expensive Stockholm? The cost is ONLY 100 SEK for 3 DAYS! And you won’t leave empty handed as you float out with glowing skin or glistening nails. Goodies bag abound. Register today from this link, and see you there! 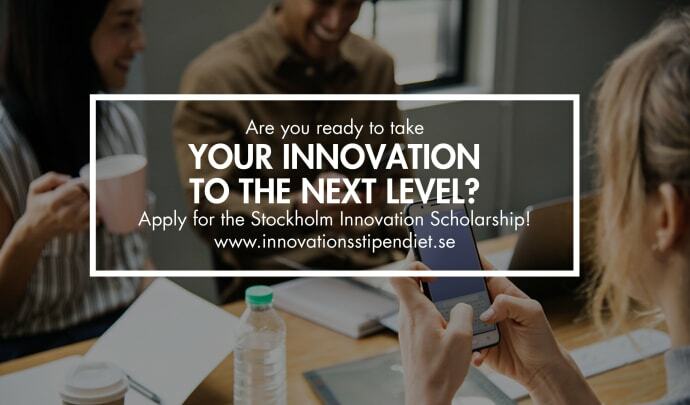 The new deadline to apply for Stockholm Innovation Scholarship is May 20. Are you ready to take your innovation to the next level? With the Stockholm Innovation Scholarship, the City of Stockholm wants to reward and stimulate creative people to develop their innovation. Are you the one we are looking for? Do you live, work or study in Stockholm County? Then you should apply for the Stockholm Innovation Scholarship for a chance to qualify for a SEK 100,000 scholarship. Your innovation can be a physical product, a service or a combination of these in the following categories: Simplify everyday life, Creative industries, Life science and health, Travel and tourism, and Social and ecological sustainability.